UPDATED: Fri., Feb. 9, 2018, 6:27 p.m. 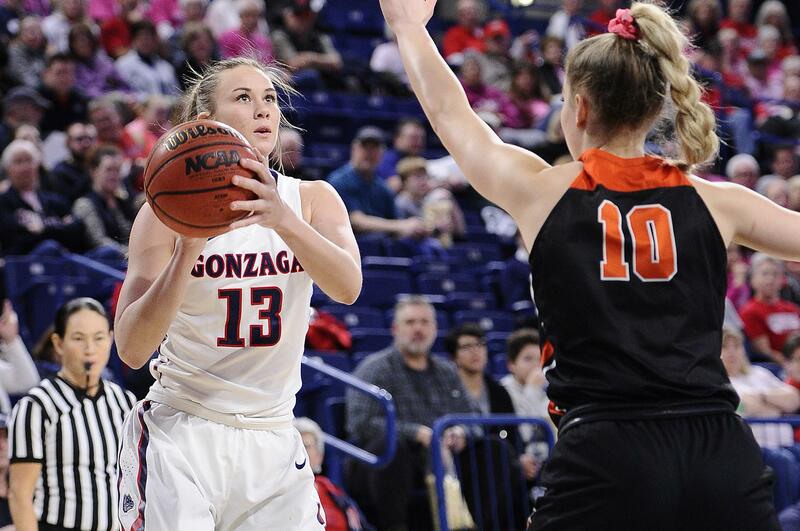 The Gonzaga Bulldogs are looking for their 16th consecutive win when they host the Saint Mary’s Gaels on Saturday. The 15-game winning streak is one short of head coach Lisa Fortier’s longest run, which was set in her first season in 2015. It’s the fifth-longest win streak in program history and the fifth-longest active streak in the country. During the streak, the Zags have outscored their opponents by an average of 20.3 points with a plus-8.9 rebound advantage. They’re shooting 46.9 percent from the field, with junior forwards Jill Barta and Zykera Rice averaging in double figures, scoring 18.6 and 12.6 points, respectively. The Bulldogs (20-4, 13-0 West Coast Conference) are riding a four-game winning streak over the Gaels (15-9, 8-5), including a 73-65 win earlier this season in Moraga, California. In that game, Gonzaga contained the Gaels’ top shooters with a strong defensive performance, picking up 13 steals and converting 22 of Saint Mary’s turnovers into 22 points. Gonzaga’s defense will be tested again against a team that leads the WCC with a 47.5 field-goal percentage. Three Gaels top the conference in that category, with junior forward Megan McKay atop the list with a 60.4 field-goal percentage. Guard Stella Beck is second in the conference with a 60.3 shooting percentage from the field, followed by forward Sydney Raggio at 54 percent. The Zags are coming off a 90-66 rout of sixth-place Pacific on Thursday, in which four Zags scored at least 10 points. Barta led the win with 25 points and 12 rebounds, her 10th double-double this season and 17th of her career. Gonzaga, which rose to a season-best 39th in the RPI on Friday, holds a four-game lead in the conference standings. The Zags need just two wins in their remaining five conference games, which includes a season finale against second-place BYU, to clinch their 14th regular-season WCC title. Published: Feb. 9, 2018, 5:20 p.m. Updated: Feb. 9, 2018, 6:27 p.m.